The True Cost of Coal Exports describes the many problems with proposals to export coal through the Pacific Northwest. Coal companies have proposed building three new coal export terminals on the west coast of the United States and Canada. If successful, these proposals would vastly increase export capacity for coal from the Powder River Basin in southeast Montana and northeast Wyoming — meaning that more coal could be mined from this region, shipped by train across the United States and parts of Canada to sell on the global market. Each step of this process — mining coal, transporting coal by train, and sale of coal to Asia — has implications for residents, communities, taxpayers, agricultural shippers, and passenger rail across Wyoming, Montana, Idaho, Washington, Oregon, and British Columbia. Coal mining and coal train transport threaten public health and safety, undermine local infrastructure, and harm property values. Exporting coal to Asia, meanwhile, contributes to global carbon pollution, and subsidizes foreign energy development at the expense of American taxpayers and communities. In essence, the public pays, while private corporations — coal companies and railroads, in particular — reap the profits. Currently, coal from the Powder River Basin is exported from Westshore, near Vancouver, British Columbia. Westshore’s coal export capacity is 14.5 million tons per year, and the terminal may expand. If the three proposed new ports and expansion at Westshore go forward, the total export capacity for Powder River Basin coal will add up to 128.4 million tons per year — or the equivalent of 47 coal trains per day, all of which would need to slice through 1,500 miles of American and Canadian cities, towns, and rural communities. public hearings and peoples’ hearings along the route from Billings to Bellingham, where citizens and leaders can make their voices heard. For more information on these events, contact the Northern Plains Resource Council. 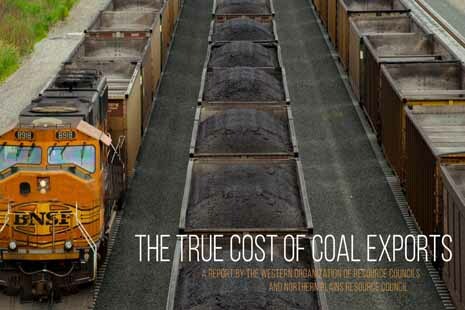 The True Cost of Coal Exports was produced by WORC and the Northern Plains Resource Council.